This beautifully crafted and utilitarian glass teapot is perfect for individual tea preparation. Details: Lapis Lazuli Blue glass handle. Makes roughly 8oz of tea when using tea basket. - Tea basket allows extra room for loose leaf tea to expand and water to flow around, making the result delicious and even tasting. 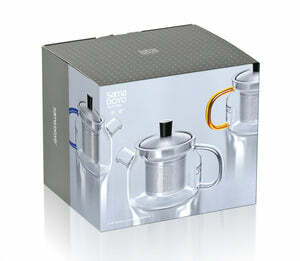 - Designed in Denmark with food-grade Stainless Steel. Perfect for use with different flavors of tea since it doesn't retain flavors. Plus, it's easy to clean! 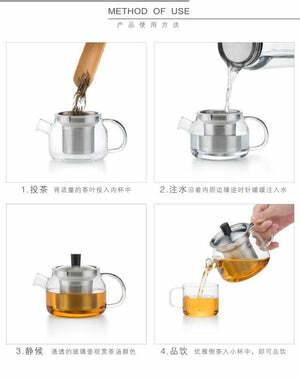 - Tea basket is easy to remove after steeping the correct amount of time, preventing astringency and overdevelopment of tea. Yes, I agree there is a definite improvement in the flavor using this teapot. I get more flavors coming through with the teapot, and watching the tea steep and the colors changing through the clear glass just elevates my tea drinking experience. So glad I treated myself to this pot :)! I was nervous about this shipping since it's all glass but it arrived chip- and crack-free. 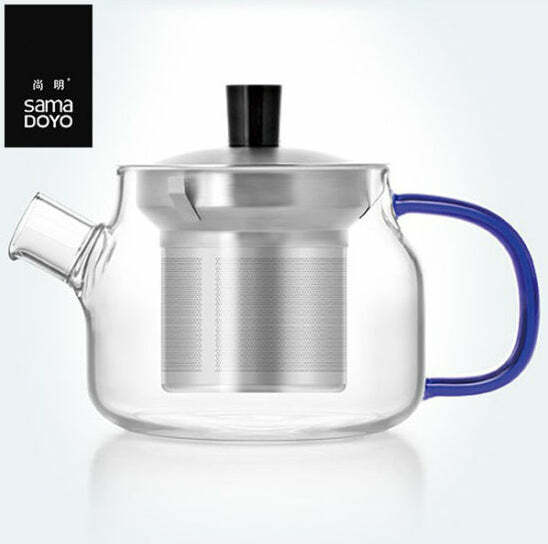 The mini pot holds one cup of tea and is clear glass except for the handle, which is a dark blue hue. This matches my kitchen decor perfectly! I made a cup of tea last night and loved being able to see the tea brewing in color. The knob on the lid doesn't get hot because it's an attached knob, and the handle didn't get hot either. The spout is really large so the tea flows fast. The filter worked great. I made a black tea pumpkin chai and didn't have any debris in the tea. Easy to clean but I dare not use the dishwasher, even though it says it's dishwasher safe. Excellent purchase and investment into my new tea ritual/habit for 2017!